The Argan (Argania spinosa) is a species of tree endemic to South-Western Morocco and to the Algerian region of Tindouf in the Western Mediterranean. Argan Oil, commonly phrased as ‘liquid gold’, is pressed from the roasted nut of the tree. The oil is extracted from the kernels, traditionally by hand, and the result is a pure form of oil valued for its nutritive, cosmetic and numerous medicinal properties. It remains one of the rarest oils in the world, due to the small and specific growing areas where the trees lie. The 100% pure Argan Oil used in the muk™ Spa Argan Oil range is sourced directly from Morocco. The oil is then blended with a precious combination of nourishing ingredients for the hair including sweet almond oil, linseed oil, aloe vera extract and hydrolyzed keratin protein. These important ingredients aid in eliminating frizz, add shine and lustre and assist in the smoothing of the hair without weighing it down. 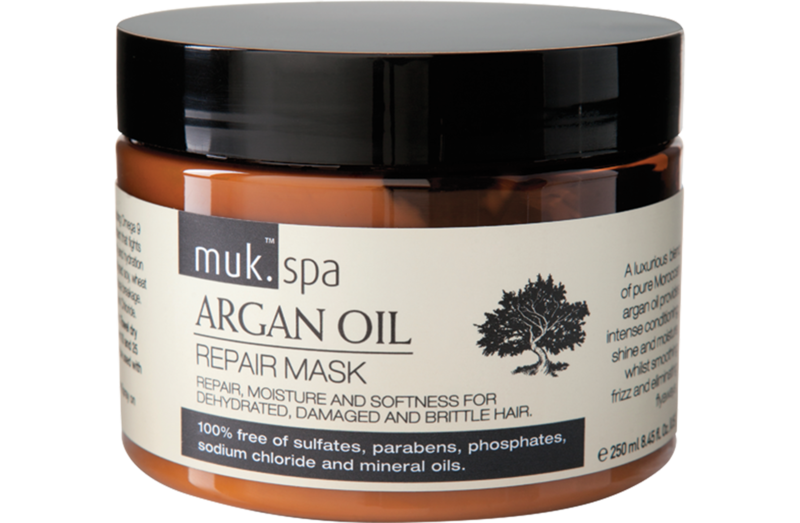 The muk™ Spa Argan Oil range of haircare is rich in essential fatty acids including Omega 9 and Omega 6. Exceptionally high in Vitamin E, a powerful anti-oxidant that fights free radicals, this luxurious formulation maintains strength, elasticity and hydration levels of the hair. The protein and moisture balanced formula, enriched with hydrolyzed soy, wheat and corn proteins, helps to dramatically increase the strength of the hair and reduce breakage. 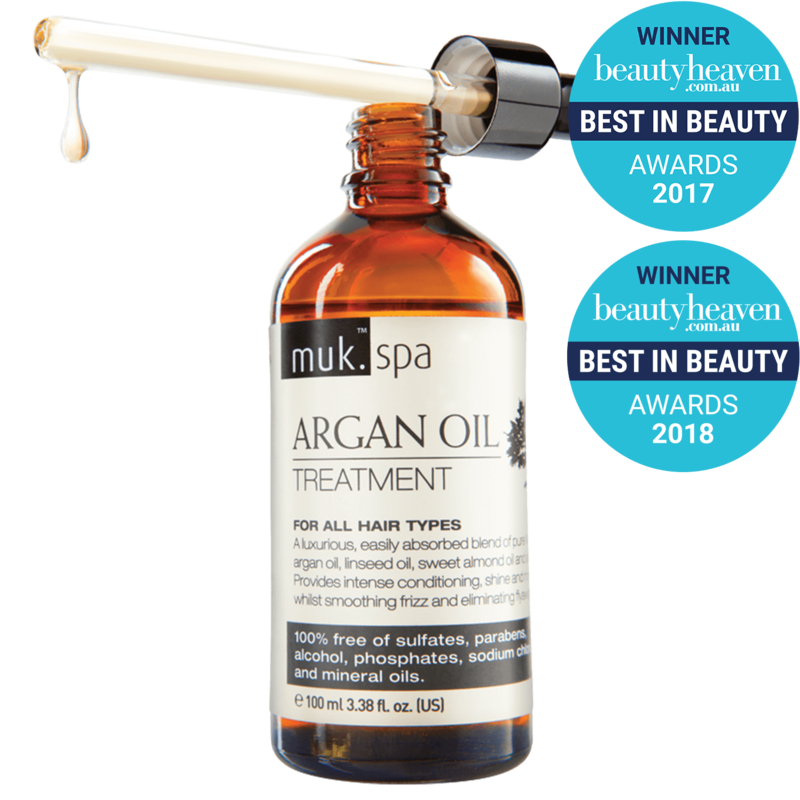 All muk™ Spa Argan Oil products are colour safe and suitable for all hair types. A luxurious blend of pure Moroccan Argan oil provides intense conditioning, shine and moisture, whilst smoothing frizz and eliminating flyaways. A luxurious, light blend of pure Moroccan Argan oil, linseed oil, sweet almond oil and aloe vera. Provides intense conditioning, shine and moisture, whilst smoothing frizz and eliminating flyaways.